Saved from the wrecking ball, this 1850’s Georgian frame house is now available for reconstruction. Everything was carefully dismantled, numbered and photographed to enable this great house to live again. Superior architectural artifacts include the wide period pine flooring, two great staircases, period mantlepiece, the doors and windows including lovely French doors that graced the front and right side gable end. The great feature of the house is the magnificent Georgian entrance with exceptional sidelights and transom. While the heavily built exterior frame will accept more than adequate insulation we thought a stone veneer could be an option…although the house was originally sheeted in clapboard. All of the well-crafted elements are now in storage safe and dry awaiting its new family. It can be enlarged if necessary as shown with a kitchen wing. 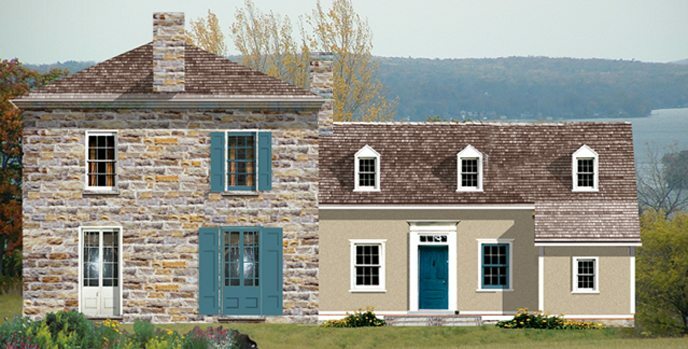 Above: Artist’s rendering of classic stone home. Below: Interior stair rail detail. Bottom: Plans for reassembly included with purchase.